Many church members, pastors and greeters have forgotten what it’s like to be a church visitor. Welcoming people to your church is the first step in growth. We’re called to share the gospel with our neighbors and we throw the doors open on Sunday morning. But too often when church visitors come, our church people are less than welcoming. Below is a series of resources that can help your church welcome the church visitor. Unwelcome: Is Your Church Sneezing on People? Church expert Jonathan Malm talks about the importance of first impressions with Sunday Sneeze. It’s a lead in to his book Unwelcome: 50 Ways Churches Drive Away First-Time Visitors. Walking into a church for the first time can be scary. Are you making your first-time guests feel welcome? Or are you driving them away—unintentionally—with bad signage, reserved seating, clunky communication and more? Learn more about Unwelcome and grab a free sample chapter. Churches face stiff competition on Sunday morning. We need to up our game. Our very first post back in 2004 talked about establishing a visitor philosophy. That’s how important this stuff is. Because if we’re not going to welcome people to our churches, then maybe we better own up to what we’re actually telling people. What if we were honest with our church visitors and gave them fair warning about what to expect (yeah, it’s kind of ugly). ‘Are they gonna make me confess my sins?’ I asked my boyfriend. He promised me they would not. That’s an actual fear of a church visitor. A Seattle newspaper sent reporters to churches to experience that first-time church visitor apprehension. One of the hardest things for churches to do is understand what it’s like for a newcomer. Sometimes we forget. And we need to remember. Embrace that awkward feeling and learn to empathize with church visitors. One way to get back in the game and remember what it’s like to be a first-time church visitor is to do it again. Go visit a different church and see what’s like. There’s an entire phenomenon called the mystery worshiper, like retail’s mystery shopper. You can do it yourself or hire a professional. Ship of Fools has collected more than 2,000 such reports—even though it’s not your church, it can be helpful to read through them. First-time church visitors don’t want to embarrass themselves. And that can be a challenge. One person’s welcome is another person’s too much. Sometimes you have to give people space. You want to make people feel welcome, but you don’t want to scare them away by being creepy welcoming. It’s a difficult paradox to navigate, but you can overcome it by empowering people to be real. First impressions are no longer physical but virtual. Potential visitors will check out your website before they walk into your worship service. Go the extra mile—don’t telling people where to go, show them. At 80% capacity, consider your church full. Time to do something, like consider multiple services. No church visitor wants to feel lonely. If your church is empty, create a more intimate atmosphere and hide those empty seats. Think about the atmosphere of your service before it starts. What can you do with those forgotten minutes to create the proper vibe? Church visitor cards: How to connect and follow up effectively. Watch your language. The words you use and how you say them can make church visitors feel like outsiders or make you look outdated. Church can be weird, so explain what’s happening. Church visitor gifts: Rationale, examples and best practice. If you talk money, be careful about how it’s contextualized. Even scrutinize the updates in the bulletin. Pastors need to be dressed well and make a good first impression. Don’t squeeze your pastor into skinny jeans if that’s not their style, but the “defrumpification of the American clergy” is a goal we can get behind. Check out these suggestions for empowering your congregation to invite people and welcome visitors. What happens after Easter or after Christmas? Make sure the follow-up to your big weekends can live up to the hype. Consider how your church can welcome 20-somethings. Check out Simply Strategic Growth for more tips and ideas for welcoming church visitors. Only 12% of first-time church visitors will return the following week and eventually become members. Yikes. Those are old numbers (1997), but you need to find ways to integrate new people into the life of your church. You can also create an email strategy to bring visitors back. But perhaps the best way is to make a good first impression and have warm, authentic members that make visitors want to come back. After all, authentic is the new awesome. Here’s a final tip: Whatever you do, don’t put a “love warning” on your sign out front. That’s a sure way to make people feel unwelcome. 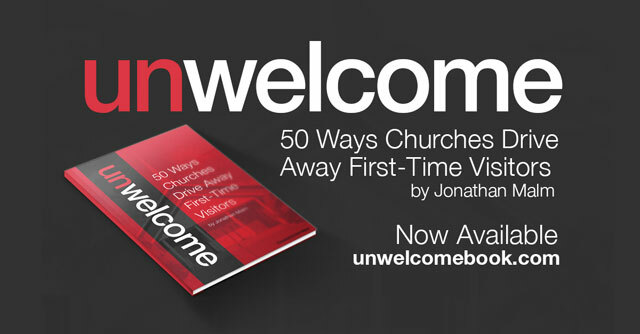 For more tips and insights on church visitors, check out Unwelcome: 50 Ways Churches Drive Away First-Time Visitors by Jonathan Malm.